Hannah simply adores gorillas. She begs her father to take her to the zoo to see her favourite animal, but Dad is always too busy. During the week he is too busy. On the weekends, he is too busy. The night before Hannah’s birthday, she asks her father for a gorilla and when she wakes, she does indeed find a gorilla on the end of her bed. A toy gorilla. Hannah is disappointed, but that night, something magical happens. And he dons Dad’s coat and he takes Hannah on a nighttime adventure – to the zoo – to see the gorillas and all the other primates encased behind bars – so beautiful and yet so utterly sad. And then to the cinema and then for cake and ice cream and then dancing on the lawn. Hannah has never been so happy. Until the next morning . 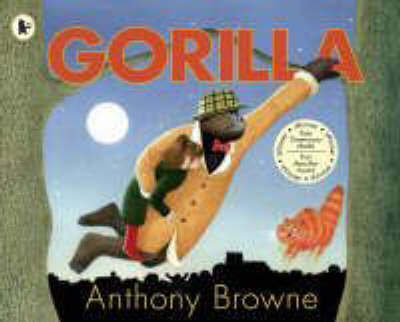 . .
Anthony Browne’s iconic illustrations beautifully highlight the inherent magic in making wishes come true. Gorilla is subtle, tender, whimsical and engagingly beautiful. Gorilla is published by Walker Books.